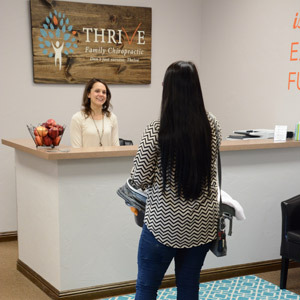 Thrive Family Chiropractic, LLC is a peaceful, laid-back and family-oriented place. Kids love our office, knowing that they can be children, playing with toys or coloring and in an environment of laughter and smiles. You can bring the necessary paperwork in with you completed. 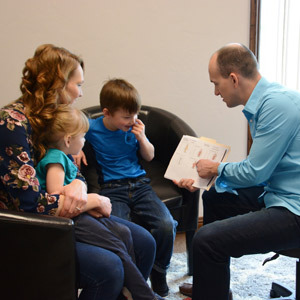 When you arrive, you’ll sit down with Dr. James to go through your health history and talk about what’s brought you in, as well as your goals. We’ll give you handouts and discuss them, explaining what we do and why we focus on your nervous system. This master control system holds the key to fulfilling your greatest potential, so we concentrate on removing any interference that may be present. To determine your level of nervous system health, we utilize scans from the Insight™ Subluxation Station, including thermography and a static electromyograph. We’ll finish up with a thorough physical examination and have you on your way in about 45 minutes. Once Dr. James has answered all your questions, he’ll give you your first chiropractic adjustment. You’ll be in and out of the office in about five minutes at your follow-up appointments. We’ve done our homework and know exactly what you need. The scans done on your first visit will be retaken at periodic intervals to ensure you’re responding well and moving closer to wellness care. Your visits will decrease in frequency as your body starts to feel, adapt and function better. Life’s stresses are constant, though, and for that reason, we recommend continuing care once you’re feeling better. Attend The Perfect Storm workshop and find out about the role of the nervous system and its relation to neurodevelopmental disorders and other common childhood ailments such as colic, constipation, allergies and sleeping difficulties. We also offer a workshop for expecting moms called Delivered, which will help you be empowered to have a comfortable, successful pregnancy. Same-day appointments are available for when you need immediate attention. Schedule your time with us today! We offer free parking for your convenience.